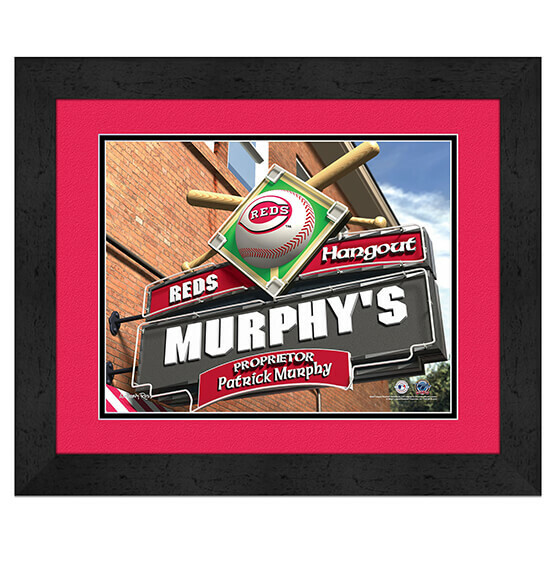 With our Cincinnati Reds Personalized MLB Pub Sign Framed Wall Art Sports decor, you can be the official proprietor of the most popular Reds hangout in town located just over Big Mac Bridge. Serve a cold one from one of the city's many breweries and enjoy some Five-Way Chili while you watch tonight's game. This custom sports decor is perfect for your very own Cincinnati Reds fan cave or to give as a cherished gift to the die-hard Reds fan in your life. Made from high-quality glass, paper and an MDF vinyl-wrapped frame, this piece all but guarantees that your next gift-giving experience will undoubtedly be a walloping four-bagger!